Organizers Anne Raskauskas, fourth from right, and Ed Burke, third from right, present a donation of $10,000 from the 2018 Bethany Beach Breast Cancer 5K to representatives of Beebe Healthcare and the Beebe Medical Foundation, to benefit the Tunnell Cancer Center. Also pictured, from left, are: Tom Protack, vice president of development for the Beebe Medical Foundation; Diane Barlow of the Beebe Medical Foundation; Judy Aliquo, president and CEO of the Beebe Medical Foundation; Derrick Johnson, Tunnell Cancer Center business manager; Barry Hamp, executive director of Oncology Services at Beebe Healthcare; and Kristen Rahn, manager of Radiation Therapy at Beebe Oncology Services. Beebe Healthcare’s Tunnell Cancer Center was recently presented with a check for $10,000 from the 2018 Bethany Beach Breast Cancer 5K Fun Run & 3K Walk. 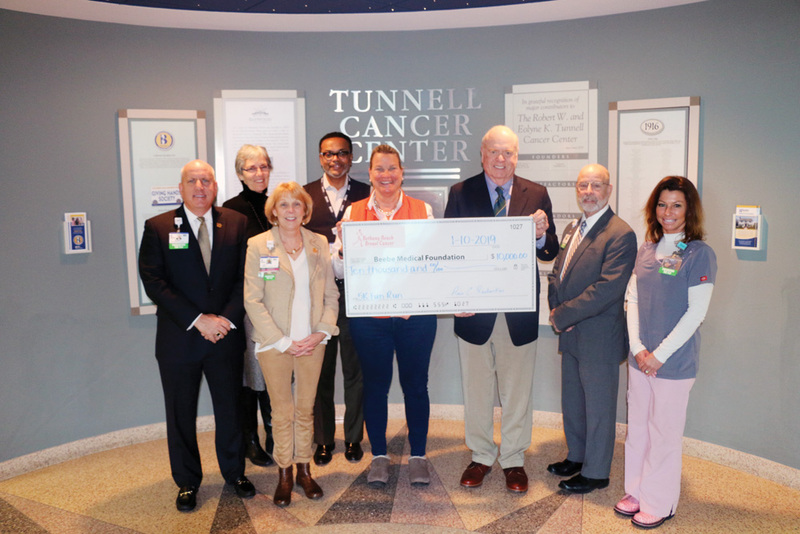 The check was presented by Anne Raskauskas and Ed Burke to the Beebe Medical Foundation at the Tunnell Cancer Center in memory of Burke’s wife, Elizabeth “Liz” Glacken Burke, who was one of the organizers of the event. Proceeds from the annual event support the Breast Health Program at Tunnell Cancer Center, which helps women receive mammograms and follow-up care. “We are proud to partner with great events such as the Bethany Beach Breast Cancer 5K,” said Judy Aliquo, president and CEO of the Beebe Medical Foundation. “What a wonderful tribute to Liz, their friend and loved one. The Beebe Medical Foundation is currently raising funds through its “I Believe in Beebe” campaign, which will help support the construction of the South Coastal Health Campus. The new campus, located near Millville, will include a second cancer center and a freestanding emergency department. Learn more at www.nextgenerationofcare.org.